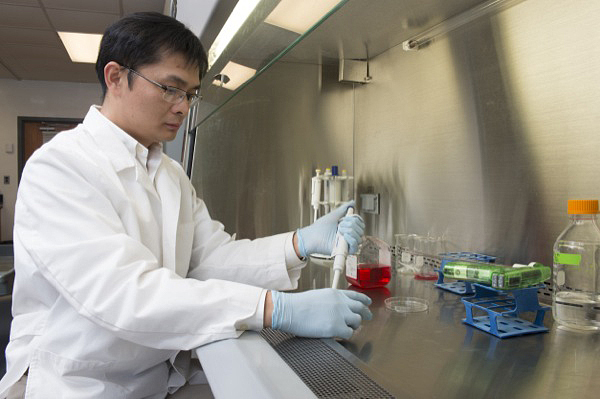 X. Lucas Lu has received Department of Defense funding for research on post-traumatic osteoarthritis treatment. 9:58 a.m., Aug. 27, 2013--Freedom doesn’t come without a price. Joint trauma, such as meniscus and ligament tears, ruptures and sprains are among the most common injuries sustained by members of the United States military during training and service. In fact, according to the University of Delaware’s X. Lucas Lu, soldiers across all branches of the United States military experience traumatic knee, shoulder and other joint injuries at rates comparable to that of professional athletes. As a result, large portions of active and inactive service members live and suffer daily with pain. While these traumatic injuries can be treated and corrected through surgery, Lu, an assistant professor of mechanical engineering with expertise in cartilage bioengineering and osteoarthritis, knows that within a few years patients often develop a condition known as “post-traumatic osteoarthritis” (PTOA). The causes of PTOA are not fully understood, however a known symptom is gradual cartilage degeneration and, eventually, complete loss of joint function. Currently, no reliable prevention treatments exist. The Department of Defense (DOD) recently awarded Lu a $1.1 million research grant to study the effectiveness of zoledronic acid (ZA) in the treatment and prevention of PTOA. A Food and Drug Administration-approved drug, ZA is a bisphosphonate used to prevent skeletal fractures in cancer patients and is a common treatment for osteoporosis. This drug can disable the function of osteoclast, the cell resorbing bone in the human body. Animal studies have shown ZA to be able to rescue PTOA induced by various traumatic damages. However, there is concern about whether use of ZA in younger patients could hamper the natural development of bones. Funded through the Congressionally Directed Medical Research Program (CDMRP) and the Department of Defense, Lu and Christopher Price, assistant professor of mechanical engineering and co-principal investigator on the project, are working to determine if localized injection of ZA can effectively prevent osteoarthritis from developing without compromising the natural bone remodeling process. Price, whose expertise lies in musculoskeletal biology and bone adaptation, will lead the animal study portion of the project. If successful, Lu’s research could lead to improved quality of life for thousands of soldiers and veterans living with joint injuries as well as lower health care costs. Liyun Wang, associate professor in the Department of Mechanical Engineering, an expert in cell mechanobiology and bio-imaging.